Tay Zombay performs his hit single, Chocolate Brains. Wow! What a coincidence! I am ALSO Tay Zonday, and I am equally impressed! Incidentally, I am also Tay Zonday and I share your feelings. 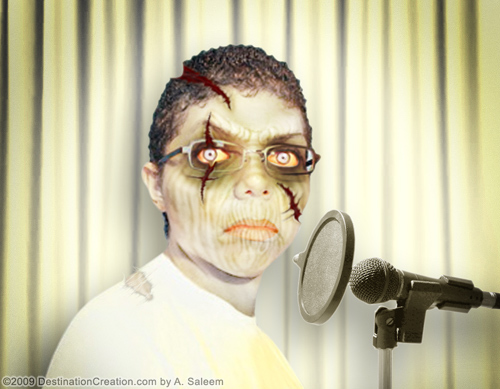 Hey guys, I`m the real Tay Zonday.I`m not kidding in my whole life. I don`t like the zombie music kind. But, I like the effect. Please don`t make fun of my songs. I am tay Zonday and this is pretty shocking. I’m not Tay Zonday! Wow! I cried, it was too funny. The I move away from the mic to spew blood part was funny. i know… i know…. im board! Pretty funny video about my song. Yes I am Tay Zonday…The real Tay Zonday. “Changing the world one song at a time”, please feel free to quote me on that. I’m baby Zonday, sitting in the womb…about to be born.